THC Biomed Makes 5th Cannabis Shipment to the Province Of B.C. VANCOUVER , Dec. 3, 2018 /CNW/ - THC BioMed Intl Ltd. (CSE: THC) ("THC", "THC BioMed" or the "Company") is pleased to announce that it has made its first shipment of cannabis to the province of Saskatchewan . The shipment includes THC BioMed's bestselling Cannabis strains in dried and pre-rolled forms. THC is also pleased to announce that it has purchased two additional strata lots in the industrial complex in Kelowna that it currently occupies. THC also announced the purchase of additional strata units in this building in October and June 2018 . The additional strata lots will be used for production purposes. THC purchased the properties as part of its expansion plan due to the high demand for its products. The purchase price was $700,000 plus fees and taxes, for a total of $733,020 . THC purchased the strata lots for cash and did not require a mortgage. Due to the high demand for our products, THC has completed its fifth (5th) shipment of cannabis products to the Province of B.C. This shipment included THC BioMed's premium CBD Strain, branded THC CBD, and our popular Atomical Haze strain. THC's vision is to be on the leading edge of scientific research, development of products and services related to the medical cannabis industry while creating a standard of excellence. As the industry develops, it will become more important to focus on scientific research and development of products and services related to medical cannabis. 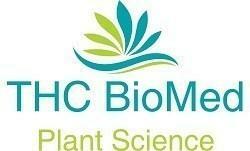 Management believes THC BioMed is well-positioned to be in the forefront of this rapidly growing industry. This press release may include forward-looking information within the meaning of Canadian securities legislation, concerning the business of THC. Forward-looking information is based on certain key expectations and assumptions made by the management of THC. In some cases, you can identify forward-looking statements by the use of words such as "will," "may," "would," "expect," "intend," "plan," "seek," "anticipate," "believe," "estimate," "predict," "potential," "continue," "likely," "could" and variations of these terms and similar expressions, or the negative of these terms or similar expressions. Although THC believes that the expectations and assumptions on which such forward-looking information is based are reasonable, undue reliance should not be placed on the forward-looking information because THC can give no assurance that they will prove to be correct. Forward-looking statements contained in this press release are made as of the date of this press release include that: (a) the additional strata lots will be used for production purposes, and (b) THC continues to work vigorously toward securing supply agreements with various provincial governments. THC disclaims any intent or obligation to update publicly any forward-looking information, whether as a result of new information, future events or results or otherwise, other than as required by applicable securities laws.